I think the way in which site design style evolves on the web is fascinating . Any site visitor can tell within a second or two when a site appears dated, and if it is, then it's immediately damaging to the brand. Getting the relationship off on the wrong foot. Whether a site design is effective naturally depends on the ability of the designers at a web design agency to select a modern design style with interactive design elements. That's why all marketers need to keep in touch with rationale behind the latest design styles and why I was keen to talk to a Twitter contact, Jim Callender of Callender Creates, a web design agency whose client portfolio showcases current design styles well. As a freelancer, Jim has worked on many high profile site such as the Times Online redesign, eBay, Royal Mail, Travelbag, Expedia, Halifax and Audi. Awarded 'Digital Freelancer of the Year (Digital/Media)' 2006. How does your design process seek to get this balance right? 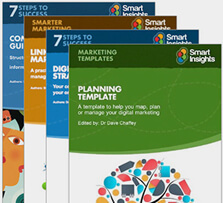 Can you give us some examples of client sites which illustrate this? Good question. This is something that is continuously evolving as the web gets older, with new technologies being added to the web designers toolbox. We can also learn directly by observing how users understand and interact with the web sites and online applications they use. A good question to ask users is why they come back to their favourite sites on a daily basis? What features are those sites offering their users? One factor that has not changed since the early days of the web, is that web sites have to be credible, and to create a sense of trust that will encourage the user to learn more about what information site is offering. This will always be the case, if the message is wrong or doesn't 'feel' right in the users mind the user will click back to the Google results. This emotional response cannot be measured accurately on the web, emotional responses to colours, font-size and page layouts. For example, on a corporate site of a multinational company how would you feel seeing a design that uses comic sans font and a black background? To support your online brand and business we now have to measure and adapt to what is happening on and around our brands. Businesses that are not evaulating their web analytics/traffic and monitoring their 'brand buzz' online are not going to go the distance compared to businesses that are this proactive and having direct discussions with customers. Think a static marketing message, like a billboard advert, compared to say how Virgin are using Twitter to have a direct dialogue with users that mention 'virgin' on the social network. Businesses that ask web design companies just for brochureware sites are missing the point with what the potential or reaching an international audience on the web. It's our job as web professionals to point out and build into a web design project the opportunities to develop their online brand and reputation as well as creating a clearer company message online. Finally, over the last year, we have seen a steady rise in copywriters who are proving to be a valuable addition to any professional web team. Advising on the best use of keywords and call to action in site headings. Making a web site interface easy to scan, and understand the different areas of a homepage for example. Blogger.com * - Clearly signposted task driven actions on the homepage - 'create blog in 3 easy steps' - users will know exactly what to do from these instructions, they are also reassured further by the friendly images on the site, and doesn't need to explain any of the technical details. Therefore, accessible for users to understand, and results in most users getting what they came to the site to do, creating a blog for free! YesInsurance * - This site uses straight-forward headings, it's obvious they have thought about the correct wording for the title for each module of the homepage. Using copywriting to 'call out' to the user, it makes the site easily and quickly understood. It also creates a 'mental model' of what the user expects to see when they click on a heading through to the subsequent page. ie: van insurance. If you don't meet the users expectations with a simple process like this, it can lead to feelings of confusion and negative feelings in the users mind. 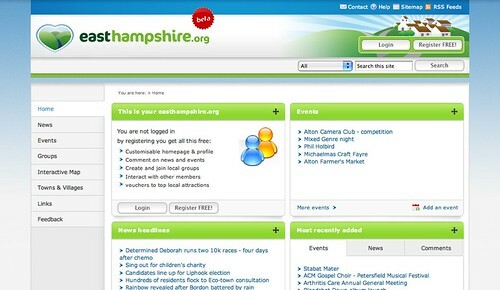 East Hampshire District Council - Working closely with East Hampshire District Council we created initial wireframes which we tested on users to find out how intuitive the design was and also whether they could understand the different parts of the site. By meeting our users needs and requirements from this early stage, we were able to tailor an experience that is information focused, in a fun, clear and visually appealing experience. Q2. What are common client concerns right now when you're pitching? I'm sure aligning the site with business goals and brand remains crucial, but what other features are they asking for beyond accessibility, usability and SEO-friendlyness? A number of interesting trends that perhaps sum up the current financial climate. Establishing a long-lasting relationship with a web design company, like Callender Creates, on a number of levels; as a consultant, designer and programmer. Being able to demonstrate to your clients that the work you have completed with other clients are of good quality, delivered on-time and you can continue to advise on implementing their web applications with up to date web technologies that are not going to disappear overnight. Requests from clients wanting to reduce the costs of future site updates, and bring this in-house with a content management system (CMS) package. This may lead to why a number of recent clients have particularly asked for Open Source software. These products compared to licenced closed source alternatives, are built on strong communities of developers and programmers who can all contribute to creating a more stable and robust software alternative. This type of software are usually free, and just costs time to configure the platform for our clients. Two types of popular software we use are WordPress a blog and publishing platform, andMagento ecommerce software. Reducing costs of future updates, and future proofing software ticks the boxes for managers and developers alike. Offering our clients this commercial open source business model yields a web based product that is superior for a fraction of the cost. Q3. With the popularity of YouTube video online, I'm seeing more sites embed video into the site to enhance the experience and increase conversion. Of course Flash has been used for similar reasons for a long time, although it seems to me as if accessibility arguments have limited it's use in the UK. What do you think are the success factors for integrating video and Flash elements into a site? Who does this well in different sectors? The success of this rich media format (video/flash) depends on what context you use the format in. They have been excellent on gadget sites where a movie can showcase a tour of the new features on a camera for example. However, if a flash movie is just for decoration, users can be quickly turned off and think 'whats the point?' - much the same with flash introductions. Including an alternative or skip link to these formats is often forgotten. Say if the video does not load correctly, or the user does not have the flash plugin installed. We are seeing video and podcast blogs that now have transcripts where there is a text version of the presentation. Which is excellent for demonstrating consideration for your users. Without your users in mind there maybe no one to enjoy your work after all. Most video channels that have gained popularity over the last 12 months are the ones where you can customise your own theme and embed this into your own web page. Much like the myspace generation have been doing for a while with widgets on their profile pages. Vimeo allows full customisation or the video player, and also offers High Definition (HD) embedding formats on its network for the premium level subscription. Seesmic was the first service that allowed users to leave video comments on blogs, such as Techcrunch.com. A trend on blogs and social networking sites that should only increase as users gain confidence in creating their own content on the web. Q. It used to be the case that review of web analytics wasn't part of the web design process at many agencies, although this is slowly changing. How do you think it can help? What do your designers look for? By understanding your visitors behaviour on a site from analytics and direct feedback you can further add to the success of the site in an agile manner from real data rather than your own opinion. These facts are ammunition in backing up reasons for going in a certain direction with a user interface design for example, and work very well within large organisations. Real user data over personal opinion everytime. Unfortunately, user experience success metrics cannot be fully analysed like ROI with PPC campaigns, so it is sometimes difficult to sell user experience to managers. However, once positive feedback comes in from an addition you recommended then they will be open to more and more suggestions based on your justified recommendations. Q. Finally, Jim, please tell us 3 questions that marketers should ask designers when they're pitching which really help distinguish an agency that is going to deliver great results. So, what can you do to convince a client that you are right for the job? I have found that most clients don't want a sales pitch, they want reassurance. They want to know if you can be trusted to help them solve their problem. 1/ Will you be there for the long-term? Designing a web site is all very well, however clients want a certain level of trust from you so they know if any alterations are required on the site, you can do them. Also clients just want a second opinion on how things work on the web, by you being available you guarantee your position as an expert on web design and interaction, as well as being someone who will be referred by your clients to other companies and suppliers. You may also be asked about your resilience plan if you are knocked over by a bus. Have your answers to these questions planned well before you are asked, that way you can demonstrate that you have the correct processes in place. 2/ What is your design process? Clients will want to know how you go about creating a site that will match their business plans and also make their customers want to keep coming back to the site. It's not just about SEO and PPC - after all, sending traffic to your site is no good if uers dont click on the 'buy now' link for example, or cannot understand how to navigate using your flash menu. 3/ Can you provide sites that demonstrate good design and user experience? Recent clients have realised their money has to work harder to get the desired result for their company web site redesign for example. Some budget holders aren't technical, it is our job as web professionals to walk them through examples of site that do things well, and sometimes site that are terrible just to demonstrate usability issues. To the designers and developers, the employees and the freelancers, your challenge is to do your best to get work done in a speedy way that does not sacrifice quality. Time really is money, be smart about your efforts and spend it wisely. Don't leave anything to chance or undone in a way that will cause further stress and anxiety for your employer as they are likely already significant pressure to keep the work coming through the door. Be proactive and anticipate problems that may arise, this way the client will have their full trust in you, even if you do make mistakes, own up and laugh about them which can trivialise them looking back. Working smarter will not only make business more successful, but ensure that clients are impressed, thankful, and very willing to recommend your business to everyone they know. If you follow these steps then nothing should ever get in your way to being very successful.